It’s National Mac & Cheese Day, in these United States. Well, I guess it’s kind of been “Creek Week” around these parts this last week, so let’s finish things up with a tugboat! 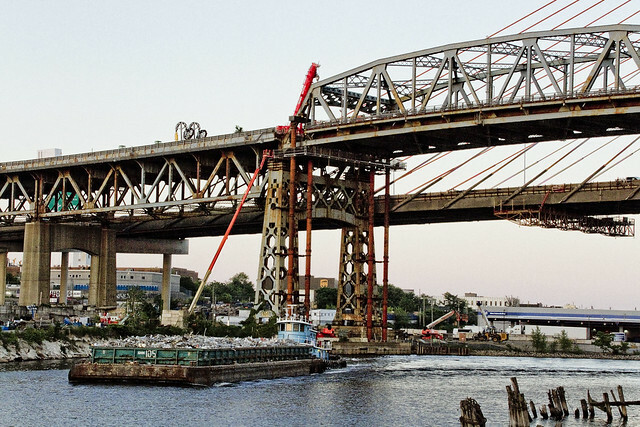 As mentioned in Monday’s post, one has been desirous of capturing a few last shot of the old Koscisuzcko Bridge before its deconstruction is engaged, just for the record… y’know? While setting up my gear for a night shoot, the Donjon Tug Brian Nicholas, which appeared in Wednesday’s post briefly, suddenly appeared. I hadn’t affixed the camera to the tripod yet, so I got busy with the clicking and the focusing. Brian Nicholas has been in many, many posts at this – your Newtown Pentacle – over the years. 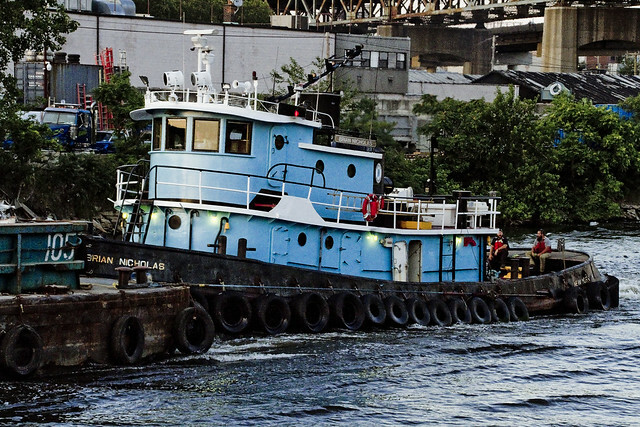 Just below is my favorite ever shot of this tug, from 2012. 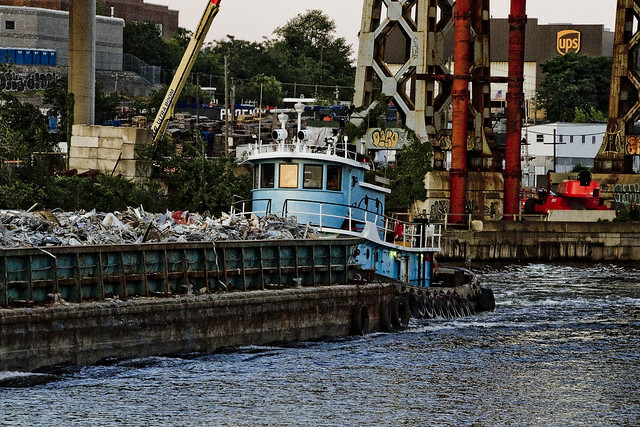 Brian Nicholas was towing a barge of what looked like shredded metals and construction debris, which would mean that it’s coming from one of the waste transfer locations found along the English Kills tributary further east. As I’ve said in the past – whether they’re pushing or pulling, tugs are always towing – that’s what the term is. 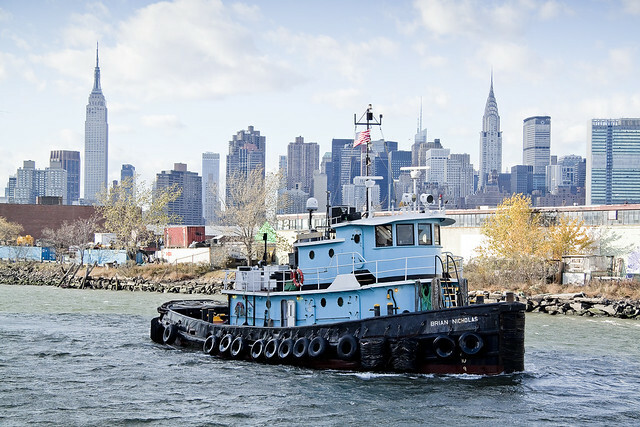 Brian Nicholas was headed for the East River, and ultimately it would likely head over to New Jersey, where the recyclable metals on its barge could be packaged up, loade on a container ship, and be then sold on a global commodities market. See you next week, with something completely different, at this – your Newtown Pentacle. 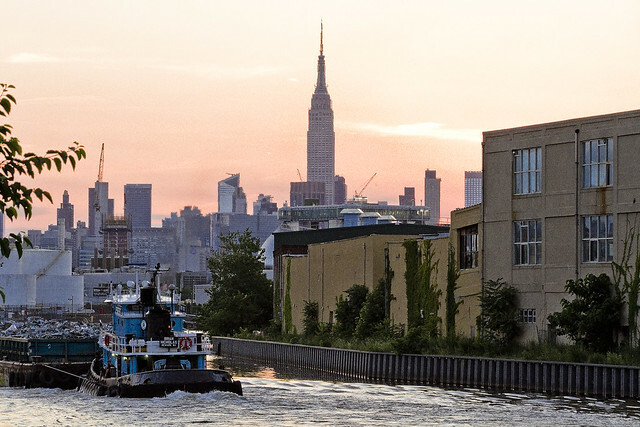 Also, I’m doing a tour of Dutch Kills tomorrow – come with? I’ll show you something cool.